Strong yet flexible, rubber plays an important role in many areas of manufacturing. It can be easily bonded to other materials or used on its own to produce new parts, as well as to coat existing tools. Various rubber manufacturing options are available, each with their own strengths and ideal uses. 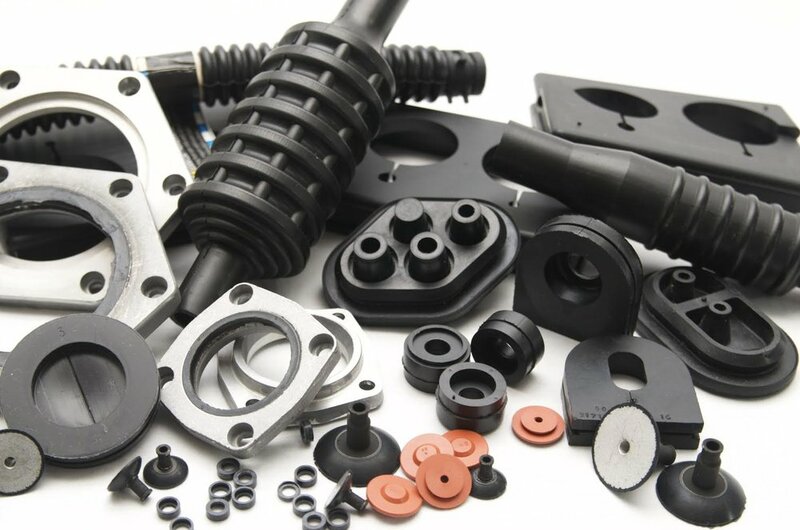 Below, we’ll dive into the advantages and disadvantages of four common types of rubber molding: compression, injection, transfer, and extruding. Compression molding is the most common process for molding rubber. In compression molding, uncured rubber is heated and compressed within a mold cavity. First, a piece of uncured rubber - called a preform - must be formed into a specific shape, size, and weight. The preform is then placed into a heated mold cavity. Once the mold is closed, heat and pressure are applied, causing the material to flow and fill the cavity. After adequate time has passed, the mold is opened and the cured rubber part can be removed. Injection molding is typically considered to be a more complex and complicated process than transfer or compression molding. However, it’s extremely effective for manufacturing a wide range of products, from very small to very large. The rubber injection molding process begins with uncured rubber, which is extracted into a rotating screw feeder system. A predetermined amount of material is pulled in through the screw feeder, and fed into a barrel where it’s heated to a specific temperature. The soft, heated rubber then flows through a gate and runner system into a mold cavity, and is left to solidify. Once it has reached a cured state, the parts can be removed from the mold. Rubber transfer molding can be thought of as a sort of “middle ground” between compression and injection molding. It’s ideal for molding intricate parts or parts that require multiple cavities, creating composite seals with insert molding, and bonding rubber to metal parts. Like compression molding, transfer molding begins with rubber preforms that are created in a predetermined size and shape. However, unlike in compression molding this preform is placed into a portion of a closed mold system called a pot. Once the mold is closed, a piston forces the rubber to flow into a mold cavity, where it is exposed to high temperatures and pressure. At the end of the cycle, the piston is raised up, the mold is opened and the parts can be removed. Rubber extrusion differs from rubber molding in that the material is forced through a die to create the end shape, rather than filled into a mold. The extrusion process can be thought of as similar to squeezing toothpaste out of a tube. First, uncured rubber is fed into an extruder, where it is then pushed towards a die. Here, the rubber is treated with high pressure and temperature. Once the rubber reaches the die, the pressure forces it through the shaped opening. The extruded rubber is then allowed to cool, and then typically reduced in length. F.R. Burger & Associates provides engineering assistance, tooling design, processing alternatives, and material solutions through our certified suppliers of ISO 9001:2008 certified rubber moldings. For more information, please contact us by phone at 440.773.3486 or by email at brian@frburger.com.